Since 1998, when UNESCO listed the old neighborhoods of Lyon as a World Heritage site, on par with cities such as Venice, Florence, and Carthage and wonders like the Pyramids of Egypt, visiting Lyon has become a must for enlightened travelers. At the time, it was the largest urban region to acquire such a prestigious status. From Fourvière, the Old Lyon, and the slopes of La Croix Rousse to the Peninsula, this site encompasses more than one thousand acres. 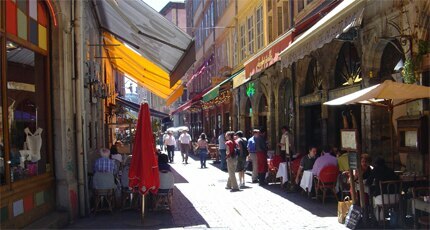 The renovation of Old Lyon has respected all the architectural styles that have marked its 2,000 years of history. Particularly noteworthy is the illumination of the city's many impressive structures. 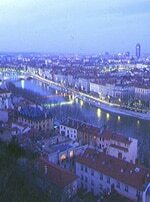 As night falls, Lyon becomes a sheer visual delight. While visiting what once was the capital of the Gauls, you should, of course, take advantage of what has truly made its reputation: its world-renowned gastronomy. Just sit down at a typical Lyon bistro or bouchon, or at a prestigious table such as Paul Bocuse. There are many young chefs from Lyon worth visiting; they are respectful of their roots and traditions, while still incorporating their own unique creativity. 300 Kilometers (186 Miles) Per Hour! You must travel to Lyon by train for two reasons. First, it will take you directly to the center of the city without the hassle of the airports. Second, it will do it quicklyextremely quickly. It only takes 1 hour and 50 minutes from Gare de Lyon in Paris (and the trip affords you the opportunity to stop over at Disneyland Paris). From Lyon, it's also very easy to reach Lille, Brussels and London quickly via TGV ("trains à grande vitesse" or high speed trains). Start your trip by discovering Old Lyon, the second largest architectural Renaissance metropolis of Europe (after Venice). It almost disappeared in the 1960s, when the then-mayor dreamed only of freeways and development and wanted to raze the whole area and get rid of all of its "old-fashioned things." It took all the determination of a group organized within the association of The Renaissance of Old Lyon and the strong efforts of André Malraux (then-Minister of Culture under Général de Gaulle) to make Lyon the first safeguarded site in France. There is a pedestrian quarter that only allows taxis dropping passengers off at hotels to enterno personal vehicles are allowed. This being the case, there's no need to rent a car if you're only going to be in town for one day. Rather, you should consider hiring a guide, so as not to miss any important historical details during your visit. This can be done by contacting the Tourist Office, which offers many skilled, multilingual guides. Explore the area by treading through the "traboules," which are passages leading through buildings rather than around them. They are open during the day but are only accessible with codes during the night. Indeed, people actually reside in Old Lyon. Extravagant, as well as modest, apartments can be found throughout the area. Climb the stairs up the hill, discovering the transoms (sculpted windows), the yards and the towers dating from the time of Catherine de Médicis. On your way, stop at the Musée Gadagne, installed within a town house that belonged to a man so rich his name has become eponymous. The Lyonnais often say "rich as Gadagne." Here is an impressive collection of puppets from throughout the ages. Lyon is also home to the famous Guignol, an extremely popular puppet show. It has a satirical foundation going back to the monarchy (of which it was very critical). It used the entertainment of children as a medium to disseminate new ideas. Guignol was an important social phenomenon in French history. Visit an artisan workshop of "automates" (the mechanical predecessors of robots which are also works or art) and the Musée de la Renaissance des Automates. Do not forget the Primatiale Saint Jean (cathedral) and its astronomical clock which puts on a show (using automates) at noon, 2 p.m., 3 p.m. and 4 p.m.
For lunch, reserve a table at La Tour Rose, preferably in the gardens during the warm months. Enjoy well-prepared world cuisine while admiring the stairs, the passages, and the famous tower which has an identical twin two buildings away. In the afternoon, finish climbing the hill through the terrace gardens. View Lyon, the roofs of the whole city and, in the distance, the Alps (weather permitting) from the square in front of the Basilique de Fourvière. It was built by the Lyonnais for the Virgin Mary, who was believed to have protected the city from the Plague. Every year, they pay homage to the Virgin on the 8th of December with the famous Fête des Lumières (Festival of Lights). If you're traveling during the warmer months, don't miss the Nights of Fourvière. These spectacular shows comprising concerts, theater, recitals, ballet and dance attract over 80,000 people every June through July, who can enjoy 40 different performances. As you make your way up, you will discover the Théàtre Romain de Fourvière, built in the 1st Century A.D. This is where the martyrdom of Christians first took place and where the lions spared Sainte Blandine as they sat at her feet, refusing to maul her. Keep the Musée de la Civilisation Gallo-Romaine for the next day. Discovered during recent excavations, these collections are exceptionally rich. You can admire the famous table of Emperor Claude.